World of anArchie is a Grammy Award winning graphic design firm based in Atlanta, Georgia. "Never Mind the i-Pod: The Boxed Set Lives"
World of anArchie found two of our latest releases on the New York Times best-of list for 2007! People Take Warning's cd surface and box cover made the cover illustration and Art of Field Recording's Margo Newmark Rosenbaum's photo made a full page header for the inside page. We are very proud of this recognition. See it here. The Winter '08 issue of Georgia Music Magazine includes a two-page spread on the Art of Field Recording box set entitled "Digging For Roots." And they were even kind enough to mention me. See it here. World of anArchie had a half-dozen releases drop in Fall 2007. We gained a new friend, Nora Guthrie at the Woody Guthrie Archives, and a new client, Josh Rosenthal at Tompkins Square Records. Both projects received 2008 Grammy nominations for Best Historical Album. The project for the Woody Guthrie Archives (WGA), called The Live Wire, was released in early September. The background on the project is that in 2001, Paul Braverman found a box of 'wire' recordings that he had made in the late 40s of different events. Two of the wires contained a performance by Woody Guthrie along with his wife, Marjorie Mazia, at the Jewish Center in Newark NJ from the Fall of 1949. 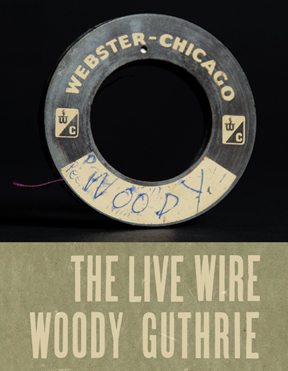 WGA had the wires transferred and restored and these recordings are the first-ever release of Woody live in performance in a concert setting. I worked with Nora Guthrie and the archivist Jorge Arevalo to produce a hard cover book + cd with never-before-seen photos of Woody and this never-before-heard concert recording. It's an illuminating listen into Woody's last years as a performer and storyteller. I am so delighted to have been involved in this historically important release. I happened to see well-known record crank Christopher King in February of '07 while at a party hosted by Larry Cohn for the old-time music Grammy nominees. 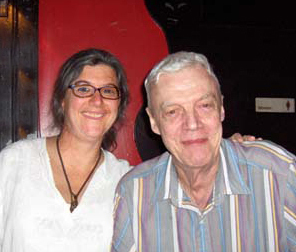 Chris and I had originally met when we received Grammys for our work on the Charley Patton boxed set in 2003. He had a new collection he was shopping around and he wanted me to design it. The project, called People Take Warning! : Murder Ballads and Disaster Songs, would be a 3 disc set celebrating the tragedies of early-20th century America. I was immediately intrigued and told him to sign me up. In May I got the call that he had sold the project to Josh Rosenthal at Tompkins Square Records. Chris and Hank Sapoznik would be co-producing and Tom Waits signed on to write the introduction. This is my first release with a major label behind it. Please read more about this project in my portfolio section. I have been blessed to work on some of the most important folk and country blues collections released over the last ten years (see MOJO or detail below). This project, for Atlanta's own Dust-to-Digital label, has been one of the most satisfying for me due to the fact that the archivist/collector, Art Rosenbaum, is still alive and working here in Northeast Georgia. Art of Field Recording is the first volume of Art's extensive field recordings made over the last fifty years. 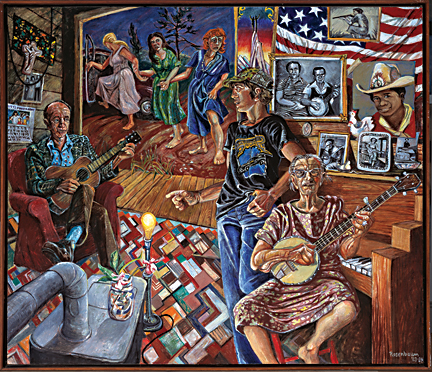 Inspired by Pete Seeger, Alan Lomax and Harry Smith, Art and his wife Margo Newmark Rosenbaum have scoured the dirt roads, riversides, mountaintops and hollers searching for unique players of centuries-old folk songs and ballads, country blues, church songs, and obscure instrumentals. Art, a Fulbright scholar and veritable Renaissance Man, is now retired from his Professorship at the University of Georgia in Athens. Among his former students are players from some of the musical influences of my 1980s young adulthood -- R.E.M., the B-52s, and Pylon. Art is a prolific storyteller, and getting together with him and his wife Margo is always an enlightening experience filled with much merriment. It's such a treat to work with people who are able to actually converse with me about their goals and desires for the project, rather than just having to rely on my perceived communications and hallucinations with the dead. I also completed two other single cds for Dust-to-Digital, Melodii Tuvi (Tuvan throat singing!) and Black Mirror, a collection of world musics by Ian Nagoski of the True Vine record store in Baltimore, Md. Again, you can check my portfolio section or Dust-to-Digital for more info on these releases. In December of 2006 we received our FOURTH (!) Grammy nomination in five years for our combined effort with Art Director Henry Owings of Chunklet fame for Dust-to-Digital's collection of recordings from Joe Bussard's Fonotone label. Henry brought in the esteemed artist Chris Bilheimer of Athens, GA to do a very fine simulated woodcut of Joe for the inside lid and promo material, seen here. The box has been critically acclaimed for its look into Joe Bussard's second passion, Fonotone Records (the first being amassing one of the world's finest 78 collections). The release party was held here in Atlanta in January of 2006, and I was able to sit within earshot of Joe and absorb the wonder of his unique oratory. You can hear the wonder for yourself on Georgia Tech's student run radio WREK (91.1 fm), at 5 on Friday afternoons or find archives online at Country Classics. The show is a rare treat and always an inspiring listen. I was featured in the Spring 2006 issue of Lisa Love's Georgia Music Magazine. The article is titled 'Where Music and Art Collide" and I am quite flattered that they use the word 'Art' to describe my work. stuff. It's what's shaped popular music as we know it today. In the April 2006 MOJO magazine, we found a 'How To Buy' Guide to Old-Time Music, which includes a list of the top ten packages of the last 10 years. World of anArchie produced four of the top ten, including #s 3, 7, 8 and 9! The guide says "Recently, new labels such as Revenant, Old Hat and Dust-to-Digital have compiled outstanding old-time sets that have boasted improved sound, notable scholarship and spectacular packaging." World of anArchie became a professional presence for me when I started working in music packaging thirteen years ago. I have been pushing digital print production for almost twenty years, with more than half of that as World of anArchie. The bulk of my work has been in special limited edition packaging -- creating museum-quality product for high profile, budget conscious, boutique labels. My clients, associates and I have worked together to create works like no others before them -- using unexpected forms, materials and details that delight and surprise. Our work is highly praised and widely imitated. We earned our first Grammy in 2003 for our work with the independent label Revenant Records, which was hailed by Rolling Stone as the "weirdest, coolest, record label in America..." and by GQ as the "best record label in America." World of anArchie earned a third Grammy nomination for our work on Revenant's monumental historical offering 'Albert Ayler: Holy Ghost.' Downbeat called 'Holy Ghost' "one of the most lovingly produced archival packages ever dedicated to a jazz musician." Revenant's Dean Blackwood says "Susan is a consummate professional who loves her work and that love, care and attention to detail is reflected in everything she does." Our second Grammy nomination came in 2005 for our work on 'Goodbye, Babylon,' a 6 disc collection of American pre-war gospel for Atlanta's own Dust-To-Digital record label, which also received a Grammy nomination for best historical box set. We have been featured in Sound Collector Magazine, in Print Magazine, and in Medialine, a recording industry trade paper. Print said, "Beauty seems to justify any extreme in Archie's design philosophy.' According to Stomp and Stammer magazine, an Atlanta-based music local, World of anArchie is rapidly becoming known as "the best in the business." I am a member of NARAS, The National Academy of Recording Arts and Sciences, and am proud to sit in the Art Director's chair on the Atlanta Chapter's Board of Governors. Thanks for visiting, please continue to look around our PORTFOLIO section, and the SPIN section, where you can read what the critics and our associates have to say. Give me a call if there's anything we can do for you. The name World of anArchie is meant to invoke the anarchic, chaotic world of problems and possibilities inherent in each and every package design project. At World of anArchie, we are obsessive-compulsive, detail-oriented, mad-meticulous, and world-class. It shows -- both in the work we do and in the critical attention paid to our work. We are passionate about music and its importance in our everyday lives. We feel that it is an absolute honor to work in this industry and we treat it that way. Our mission is to use that passion to create the best possible product for each project that comes through our door, regardless of budget or scope, whether it be a simple jewel case or an extravagant indulgence. World of anArchie provides CD, LP, and special edition music packaging for record labels and independent musicians. Services include art direction, graphic design, project management, digital photo retouching and enhancement, book design, branding and label i.d., advertising, and digital pre-press for your designs. We have over 12 years of experience managing projects with budgets from $1,000 to over $250,000. We also do posters, invitations, books, catalogs, announcements, anything really -- for anyone needing design assistance. We have an active client roster of several labels from Los Angeles to New York City, including Revenant Records, Dust-to-Digital, Tompkins Square Records, Table of the Elements, American Odeon, and edition... I have been working in the music industry for nearly thirteen years and before that, in electronic graphic design/corporate communications since 1986, for corporate giants such as Citibank/Citicorp, IBM, Kaiser-Permanente, and PricewaterhouseCoopers. Best of all, we can help lower the cost of your next package. After thirteen years of experience, we have all of the skills, tools, and resources in place to offer affordable rates. We can call on a proven network of designers, photographers, illustrators, even a type foundry. Our shop is located in Atlanta, which makes day-to-day costs cheaper than in New York or Los Angeles. For more information about World of anArchie, go the PRESS section and read the article from PRINT Magazine or my interview in SOUND COLLECTOR.